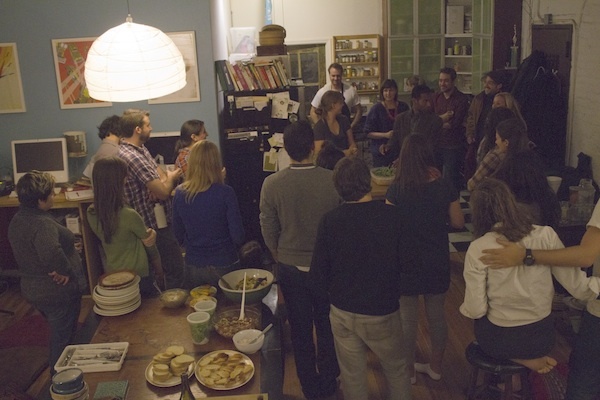 On a recent brisk fall night, 27 hungry Brooklyn Bridge CSA members gathered at 3B, a lovely bed and breakfast in Downtown Brooklyn, to participate in the first ever Brooklyn Bridge CSA Dinner and Cooking Demo. With bottles of wine in hand, local food lovers came from as far as Bed-Stuy and Prospect Heights to enjoy a 9-course vegetarian meal prepared by CSA member and professional chef Laura Allen (Aureole, Fleisher’s Grass-fed and Organic Meats, The River Café). After a bit of mingling, the crowd gathered around as Chef Laura took to the butcher block for a cooking demo using produce donated by Farmer Fred from Sang Lee Farms. Within 20 minutes, the room had learned how to prepare basil in a chiffonade style, use up the pounds of sweet potatoes sitting in their pantries, and turn kohlrabi into something they’d actually want to eat. Laura explained and put the finishing touch on each dish as it made its way to the communal table. 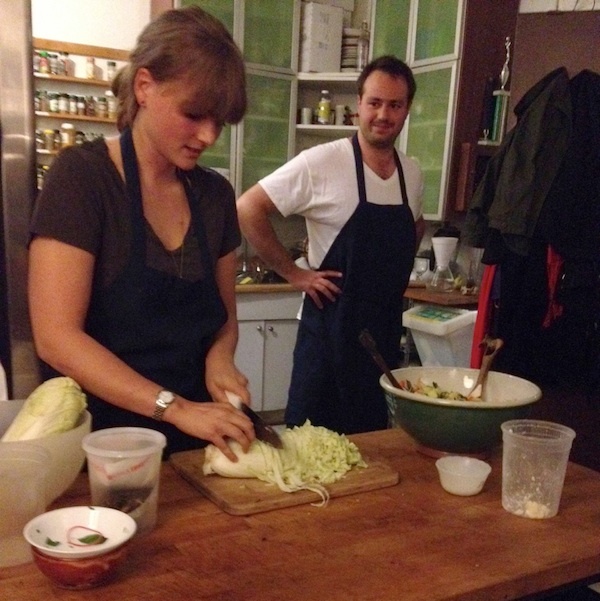 Chef Laura Allen expertly chopping some napa cabbage for her quick pickled kimchi salad. 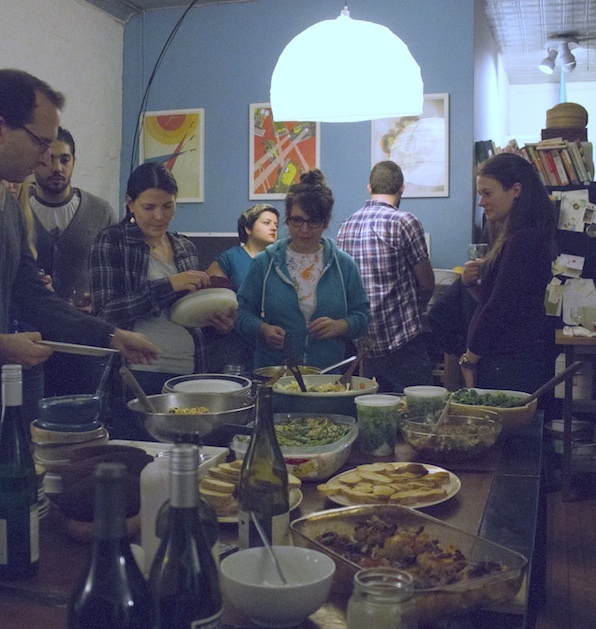 Soon enough, everyone was ready to dig in and settle down for an evening of good food and good company. CSA members surveying the amazing spread of vegetarian dishes prepared with produce from Sang Lee Farms and the Borough Hall Greenmarket. In case there was any doubt, the event was an absolute hit for everyone involved – we couldn’t have asked for a better turnout and a more successful inaugural BBCSA Dinner and Demo. Stay tuned for more like it in the future! Follow Chef Laura’s blog, Pineapple Kitchen, for more delicious, simple recipes that use locally sourced meat and produce. 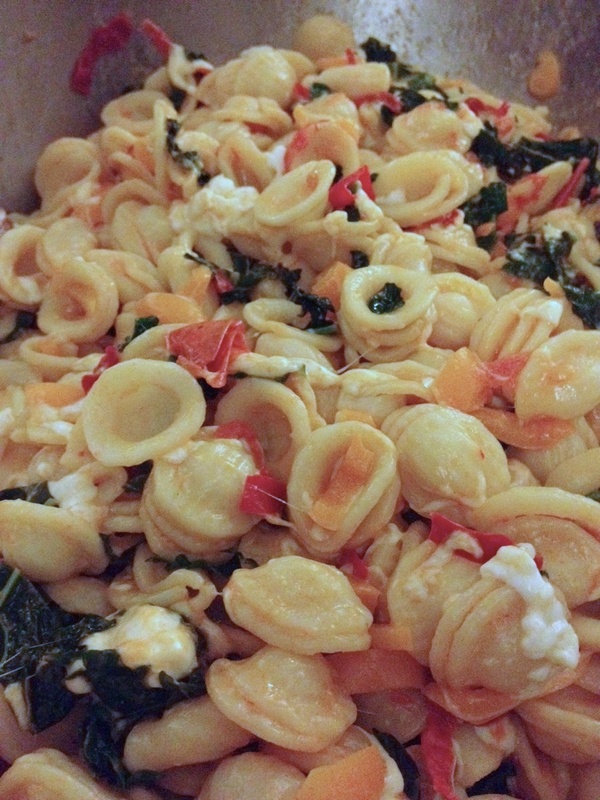 For more recipes from the CSA dinner, contact Joelle at brooklynbridgecsa@gmail.com. Feedback on your experience at the dinner will be greatly appreciated!